Background Adverse effects of anticholinergic medications may contribute to events such as falls, delirium, and cognitive impairment in older patients. To further assess this risk, we developed the Anticholinergic Risk Scale (ARS), a ranked categorical list of commonly prescribed medications with anticholinergic potential. The objective of this study was to determine if the ARS score could be used to predict the risk of anticholinergic adverse effects in a geriatric evaluation and management (GEM) cohort and in a primary care cohort. Methods Medical records of 132 GEM patients were reviewed retrospectively for medications included on the ARS and their resultant possible anticholinergic adverse effects. Prospectively, we enrolled 117 patients, 65 years or older, in primary care clinics; performed medication reconciliation; and asked about anticholinergic adverse effects. The relationship between the ARS score and the risk of anticholinergic adverse effects was assessed using Poisson regression analysis. Results Higher ARS scores were associated with increased risk of anticholinergic adverse effects in the GEM cohort (crude relative risk [RR], 1.5; 95% confidence interval [CI], 1.3-1.8) and in the primary care cohort (crude RR, 1.9; 95% CI, 1.5-2.4). After adjustment for age and the number of medications, higher ARS scores increased the risk of anticholinergic adverse effects in the GEM cohort (adjusted RR, 1.3; 95% CI, 1.1-1.6; c statistic, 0.74) and in the primary care cohort (adjusted RR, 1.9; 95% CI, 1.5-2.5; c statistic, 0.77). Conclusion Higher ARS scores are associated with statistically significantly increased risk of anticholinergic adverse effects in older patients. 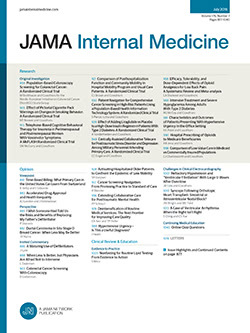 Although treatment guidelines such as the Beers criteria can be used to identify medications that are considered inappropriate in adults older than 65 years,6 12% to 21% of older patients in the United States use such agents.7,8 Medications with anticholinergic properties have frequently been cited in the literature as causing an increase in adverse events.9,10 Such conditions often lead to consequences such as falls, impulsive behavior, and loss of independence.11,12 Higher rates of cognitive dysfunction and delirium are found in patients experiencing a greater anticholinergic load.12-17 Most importantly, the reduction of anticholinergic medications may be a modifiable risk factor to avoid associated morbidity. In response to this, we developed the Anticholinergic Risk Scale (ARS), which is a tool for estimating the extent to which an individual patient may be at risk of anticholinergic adverse effects that can lead to cognitive dysfunction and delirium. The ARS ranks medications for anticholinergic potential on a 3-point scale (0, no or low risk; 3, high anticholinergic potential). The ARS score for a patient is the sum of points for his or her number of medications. The objective of this study was to validate the ARS score against clinical symptoms of anticholinergic toxic reactions in a retrospective geriatric evaluation and management (GEM) cohort and also in a prospective older primary care population. We hypothesized that (1) the ARS score would be positively associated with the risk of anticholinergic symptoms; (2) central adverse effects (falls, dizziness, and confusion) would be more prevalent among the GEM cohort than among the primary care cohort, attributable to the fact that the GEM cohort had more cognitive impairment and increased sensitivity to anticholinergic medications10; and (3) the GEM and primary care cohorts would be equally susceptible to peripheral adverse effects (dry mouth, dry eyes, and constipation), and the ARS would identify increased risk of peripheral adverse effects similarly in both cohorts. This study enrolled 2 cohorts of patients. The retrospective cohort consisted of 132 participants, 65 years or older, seen consecutively in GEM clinics at the Veterans Affairs Boston Healthcare System from July 1, 2004, to March 31, 2005. Multidisciplinary GEM clinics conducted patient and family interviews by a geriatrician (J.L.R. ), nurse practitioner, social worker, and pharmacist (M.J.S. and M.C.A.). The pharmacist performed medication reconciliation based on the electronic medical record and the patient's presentation of medications or a medication list. The prospective cohort comprised 117 male subjects, 65 years or older, who were attending primary care clinics at the Veterans Affairs Boston Healthcare System from September 1, 2005, to June 30, 2006. We selected male subjects because of the predominance of men in our population and the high proportion of men in our retrospective cohort. Subjects in the prospective cohort provided written informed consent. The Veterans Affairs Boston Healthcare System institutional review board and research and development review committees approved the protocols. The 500 most prescribed medications within the Veterans Affairs Boston Healthcare System were reviewed independently by 1 geriatrician (J.L.R.) and by 2 geropharmacists (M.J.S. and M.C.A.) to identify medications with known potential to cause anticholinergic adverse effects. Topical, ophthalmic, otologic, and inhaled medication preparations were excluded from review. All medications generated by these reviews were (1) entered into the National Institute of Mental Health psychoactive drug screening program Ki Bank database18 to determine the dissociation constant (pKi) for the cholinergic receptor; (2) input into Micromedex (Thomson Micromedex, Greenwood Village, Colorado), an evidence-based review of all Food and Drug Administration–prescribed medications, to determine rates of anticholinergic adverse effects compared with placebo; and (3) searched via MEDLINE to identify medical literature related to anticholinergic adverse effects. The 3 panel members were given the available information, and they ranked the identified medications on a scale of 0 to 3 according to anticholinergic potential (0; limited or none; 1, moderate; 2, strong; and 3, very strong). There was strong agreement with respect to the medications included on the list among the reviewers (κ range, 0.85-0.89; P < .001) and in the agreement among ARS medication rankings (r range, 0.70-0.83; P < .01). In the event of a disagreement, the median ranking was used to rank the medication. An individual's ARS score was calculated as the sum of the ARS rankings assigned for each of the medications that the patient was taking, as determined by medication reconciliation. As part of the standard interview in the GEM clinics, a comprehensive geriatric review of systems that are documented in the medical record was conducted among participants. This review of systems identified anticholinergic adverse effects, including falls, dry mouth, dry eyes, dizziness, confusion, and constipation. In the prospective cohort study, a modified review of systems (20 questions) that included the same adverse effects was conducted among the primary care patients. We assigned 1 point for each adverse effect and used the summed number of anticholinergic adverse effect points in our analysis. To better capture the nature of the adverse effects and to evaluate our second hypothesis, we categorized the anticholinergic adverse effects as central effects (falls, dizziness, and confusion) and as peripheral effects (dry mouth, dry eyes, and constipation). Data on medications and adverse effects were collected by geriatric pharmacy residents who were blinded to the ARS groupings and study aims. All statistical analyses were performed using commercially available software (STATA SE version 9.1; StataCorp LP, College Station, Texas). The GEM and primary care cohorts were compared using t test for continuous variables and χ2 test for dichotomous and ordinal variables. Our primary exposure was the ARS score for a patient. Our primary outcome was the count of anticholinergic adverse effects. Because our exposure and outcome variables were not normally distributed, we categorized the participants in both cohorts into the following 3 groups: (1) those with an ARS score of 0 (no ARS medications), (2) those with an ARS score or 1 or 2, and (3) those with an ARS score of 3 or higher. The anticholinergic adverse effect count was compared with and within these ARS groups using χ2 test. Because our exposure and outcome variables did not conform to a normal distribution, we selected Poisson regression for unadjusted and multivariate analysis. Poisson regression analysis is preferred for nonnormal data when the primary outcome variable is a nonnegative count. From this analysis, we reported the risk of anticholinergic adverse effects with increasing ARS score. Multivariate modeling adjusted for age and for the total number of medications and was used to calculate the c statistic for model discrimination. Poisson model fit was determined using the deviance statistic. Table 1 gives the characteristics of the retrospective GEM cohort and of the prospective primary care cohort. As expected, the GEM patients were older than the primary care patients. Serum creatinine levels were similar in the 2 cohorts. The GEM patients were taking statistically significantly fewer medications than the primary care patients (mean [SD], 7.9 [2.8] vs 9.0 [4.5]; P =.05). However, the ARS scores were higher among the GEM patients (mean [SD], 1.4 [1.9] vs 0.7 [1.2]). The ARS scores were not normally distributed, and the primary care patients were less likely to be taking medications listed on the ARS. The GEM patients were more likely to report central adverse effects, including falls, dizziness, and confusion, than the primary care patients, although dizziness did not reach statistical significance. Compared with the GEM cohort, the primary care cohort reported dry mouth more frequently, dry eyes less frequently, and constipation about equally. Table 2 gives the numbers of anticholinergic adverse effects associated with ARS scores of 0, 1 to 2, and 3 or higher. Among both cohorts, the prevalences and numbers of anticholinergic adverse effects statistically significantly increased with higher ARS scores (P < .001 for both). This is initial evidence of a dose-response relationship. In both cohorts, when the total ARS score was 3 or higher, 70% or more of the patients reported 2 or more anticholinergic adverse effects. Table 3 gives the unadjusted risk ratios in the cohorts for the total numbers of anticholinergic, central, and peripheral adverse effects. The deviance statistic was acceptable (P > .05) for all models. A sensitivity analysis with continuous ARS scores and ARS groupings did not notably change the regression results; therefore, the ARS groupings are presented to improve clinical usefulness. In both cohorts, higher ARS scores were associated with increased risk of anticholinergic adverse effects (GEM cohort crude RR, 1.5; 95% CI, 1.3-1.8 vs primary care cohort crude RR, 1.9; 95% CI, 1.9-2.4). Both cohorts had similar risks of peripheral adverse effects (GEM cohort crude RR, 1.6; 95% CI, 1.2-2.2 vs primary care cohort crude RR, 2.1; 95% CI, 1.6-2.8). Higher ARS scores were associated with increased risk of central adverse effects in the GEM patients (GEM cohort crude RR, 1.5; 95% CI, 1.3-1.8 vs primary care cohort crude RR, 1.3; 95% CI, 0.8-2.1). After adjustment for age and the total number of medications, higher ARS scores statistically significantly increased the risk of anticholinergic adverse effects in both cohorts (GEM cohort adjusted RR, 1.3; 95% CI, 1.1-1.6 vs primary care cohort adjusted RR, 1.9; 95% CI, 1.5-2.5), and there was good model discrimination (GEM cohort c statistic, 0.74; primary care cohort c statistic, 0.77). Consistent with our primary hypothesis, this study found that the ARS score was reliably associated with the risk of anticholinergic adverse effects in GEM patients and in older primary care patients after adjustment for age and the total number of medications. The GEM patients described more central adverse effects than the primary care patients. After adjustment for age and the number of medications, higher ARS scores were associated with increased risk of central adverse effects in the GEM cohort but not in the primary care cohort. In the primary care patients, ARS scores were associated with the adjusted risk of peripheral adverse effects. Because older patients have increased susceptibility to anticholinergic toxic effects of medications, the assessment of toxic reactions is crucial in older populations. Our findings are consistent with other studies that created ranked lists of anticholinergic medications and associated these with clinical outcomes. Han et al17 used similar methods to develop a ranked list of anticholinergic medications that were positively correlated with delirium severity in medical inpatients. The present study is similar because our outcome was clinical adverse effects from anticholinergic medications. However, our study expands the ranked list to older outpatients in GEM and primary care settings. In the GEM cohort, the adjusted ARS score was associated with the risk of central adverse effects. The GEM patients, who are frequently referred for cognitive complaints, were more likely to report central adverse effects than the primary care cohort. Patients with dementia are more susceptible to the effects of anticholinergic medications and are more likely to receive them.16 Unfortunately, adjustment for cognitive impairment was impossible in this study but might have provided information about the contribution of anticholinergic medications to dementia. We can only conclude that those patients referred for GEM evaluation are at increased risk of central adverse effects. Among older primary care patients, the ARS score was associated with the risk of peripheral adverse effects. This may have resulted from (1) increased function in these patients; (2) less cognitive impairment, resulting in more accurate history taking; (3) lower prevalence of central adverse effects, which may have resulted in increased reporting of peripheral adverse effects; or (4) addition of the pharmacy team to ask about anticholinergic adverse effects, also leading to increased reporting of peripheral adverse effects. Overall, the ARS score was associated with the risk of central and peripheral adverse effects. Although the prevalence of anticholinergic adverse effects cannot be fully explained using the ARS score, the clinical findings represent an opportunity to improve care among older patients. For example, a single medication with an ARS score of 3 would likely cause 2 or more anticholinergic adverse effects in more than 70% of the patients in the GEM and primary care cohorts. There are several strengths to our study. First, the measurement of ARS score and anticholinergic adverse effects in a retrospective cohort and in a prospective cohort improves the generalizability of the study. Second, there was good agreement among the experts in the selection of medications for the ARS and good correlation in the ranking of medications on the ARS. Third, the electronic medical record, which included pharmacy records, allowed us to perform comprehensive medication reconciliation. Fourth, the blinding of the data collectors to the ARS improves the validity of our findings. Fifth, our results persisted after adjusting for potential confounders, including age and the number of medications. Our study has weaknesses that require mentioning. Although calculating the ARS score is not difficult (Table 4), completing the ARS during the individual patient encounter is less practical compared with asking 6 questions about anticholinergic adverse effects. Therefore, we believe that there are 2 primary uses for the ARS. First, the ARS is a useful tool to identify patients at risk of anticholinergic toxic reactions in large patient databases such as those of a hospital, nursing home, health system, rehabilitation center, or pharmacy benefit manager. Prophylactic pharmacy intervention clinics designed to reduce anticholinergic exposure could minimize potential anticholinergic toxic reactions. Second, the ARS would be a useful educational aid for clinicians to identify medications with anticholinergic adverse effects so that they might avoid prescription. Adverse effects related to anticholinergic medication use can have negative effects in older patients. The ARS is a categorically ranked list of medications that predicted increased risk of anticholinergic adverse effects in older patients. We believe that these findings have implications in the identification of older patients at risk of anticholinergic toxic reactions across a spectrum of care settings. Once identified using the ARS, proactive interventions could reduce complications and preserve functioning. Further study of the effectiveness of such a program is warranted. Correspondence: James L. Rudolph, MD, SM, Geriatric Research, Education, and Clinical Center (GRECC), Veterans Affairs Boston Healthcare System, Mail Stop JP-182, 150 S Huntington Ave, Boston, MA 02130 (jrudolph@partners.org). Accepted for Publication: September 29, 2007. Author Contributions:Study concept and design: Rudolph, Salow, and Angelini. Acquisition of data: Rudolph and Salow. Analysis and interpretation of data: Rudolph, Angelini, and McGlinchey. Drafting of the manuscript: Rudolph, Salow, and McGlinchey. Critical revision of the manuscript for important intellectual content: Rudolph, Salow, Angelini, and McGlinchey. Statistical analysis: Rudolph and McGlinchey. Obtained funding: Rudolph and McGlinchey. Administrative, technical, and material support: Rudolph, Salow, and McGlinchey. Study supervision: Rudolph and McGlinchey. Financial Disclosure: Dr Angelini has consulted for Eli Lilly and has received lecture fees from Eli Lilly and AstraZeneca. Funding/Support: This study was supported by grant K12 AG000294-18 from the National Institute on Aging (Dr Rudolph), by grant R01 1405 from the National Institute on Alcohol Abuse and Alcoholism (Dr McGlinchey), and by a Veterans Affairs Merit Review (Dr McGlinchey). Previous Presentation: This study was presented as a poster at the 2007 American Geriatrics Society Annual Scientific Meeting; May 4, 2007; Seattle, Washington. Additional Contributions: Richard N. Jones, ScD, assisted with the statistical analysis. Ryann Welch, PharmD, and Ingrid Michael, PharmD, contributed to data collection and analysis.